A lot of us eventually reach the point when we realize we are getting a bit rotund (or worse) and start thinking about watching (or losing) weight, or maybe just being more conscious about nutrition. With several of those things in mind (or should I really say on my mind) I did some web browsing. I found a website that I’d like to share with you: A Slice of Nutrition. I found this through another blog that I follow, My Imperfect Kitchen, that had a post by Avital Greenbaum as a guest blogger–Chicken, Zucchini, and Quinoa. One dish meals are very appealing to me–at least some of the time, because I can be lazy, have a good meal and not have to wash lots of pots and pans. (No, Frankie refuses to do that!) I’ve had quinoa in breakfast cereals, and things like that but after reading how healthy it is, I decided I need to try it in a main dish and this looked like a great place to start. I do have to admit that, as well as being constitutionally unable to make a small pot of soup, I seem to be unable to leave a recipe alone when I’m making it. I did almost follow this one. 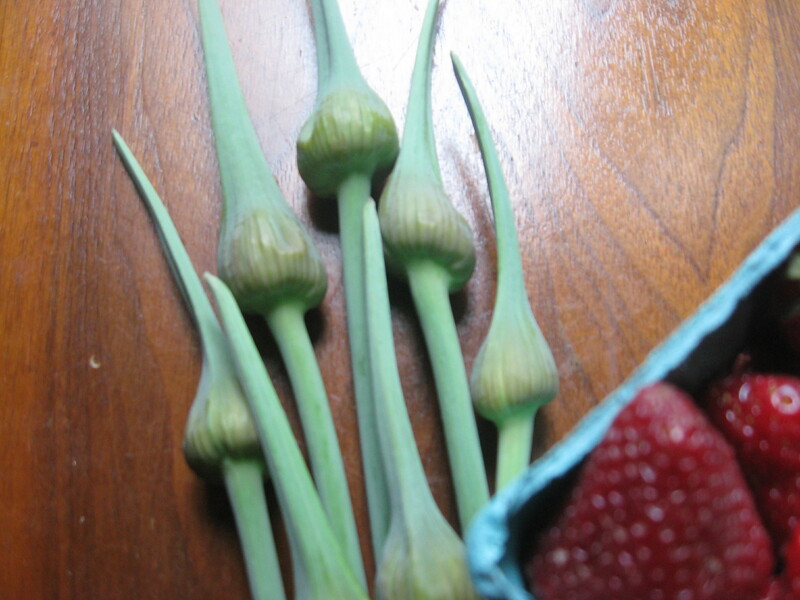 Instead of garlic powder, I had fresh, green garlic scapes from the farmers’ market. Those went it, and I added some mushrooms; otherwise, I left it alone. 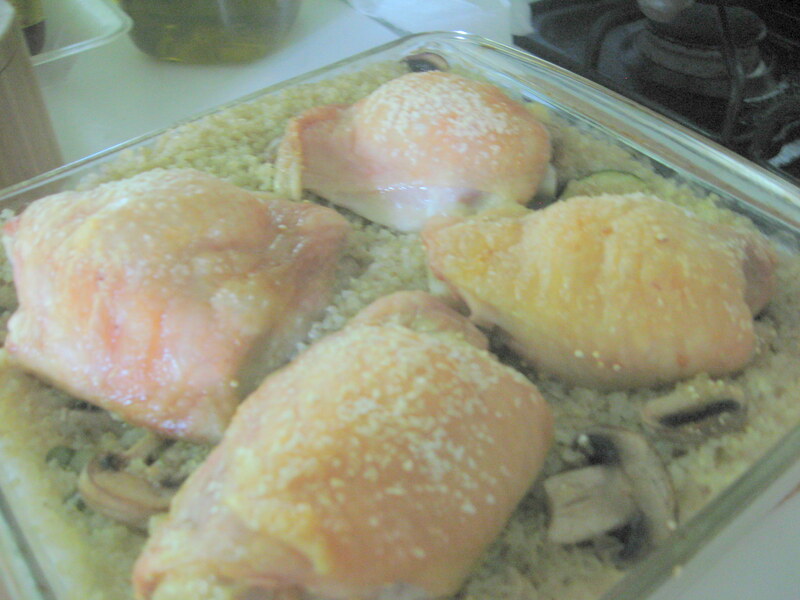 This one-dish meal is now in the oven (despite the heat) getting ready for my supper. Since my veggies are included with the dish, I think that all I’ll need to add is some of those luscious ripe strawberries as dessert! This is a keeper–only a few minutes prep, and it’s unattended cooking with tasty results. The quinoa is very light–good in hot weather. I think that it might make some very tasty “salads” with lentils for satisfying summer meals when the weather is sweltering and I want a light meal. You’re most welcome! That’s a dish that is easily done for one person too. Another thing I like about it is that it was good used at room temperature on a hot sultry day–just a few drops of extra-virgin olive oil over it. It would do well as a “brown-bag” lunch, too.